UPDATE: As of 4/30/17 it appears that Paws & Play (who had changed their name to FURKID by Paws & Play) went out of business. I will update again if the re-emerge but, for now, it’s safe to assume that another one has bitten the dust. 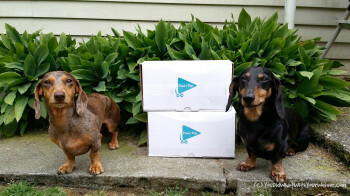 We’re on a mission to try every dog subscription box available. We recently got to try the Paws & Play monthly dog box. As with all of these services, the “surprise, you’ve got goodies” element is the biggest draw for me. 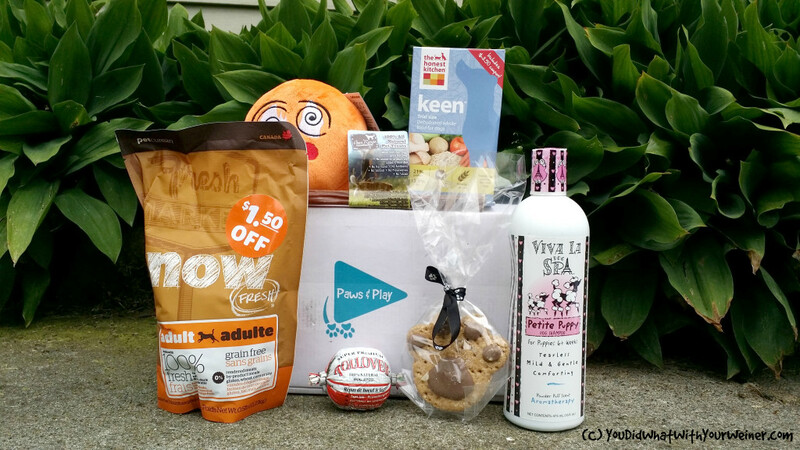 Paws & Play hand picks wholesome, new-to-market products from quality brands to include in each monthly box. Paws & Play is Canadian owned and sourced (so keep in mind any prices you are seeing online is in Canadian dollars). Paws & Play offers three different boxes, with a minimum of three options on each, for over 12 ways to customize your box. You can choose their standard, premium box, for $30 (CAD) a month that includes 7 – 10 of their best and newest hand picked products. You also have the option to get the smaller, To Go Box, for $15 (CAD) that includes 4 – 7 of their most popular items from new and previous boxes. There are 5 “dog size” options to chose from, ranging from”toy” to “giant”, when ordering and each box is available in a cat version. If you have a bigger pet family, you can order the Mix Pet Box for $39 (CAD) that includes 9 – 17 product for a 2 dog, 2 cat, or both a dog and cat household. Shipping to Canada and the US is $5.95. UPDATE: The shipping rate varies per box and per location. If you live in Canada the shipping cost will range from $3.95 to $7.95. If you live in the US you will pay a flat shipping fee of $7.95. 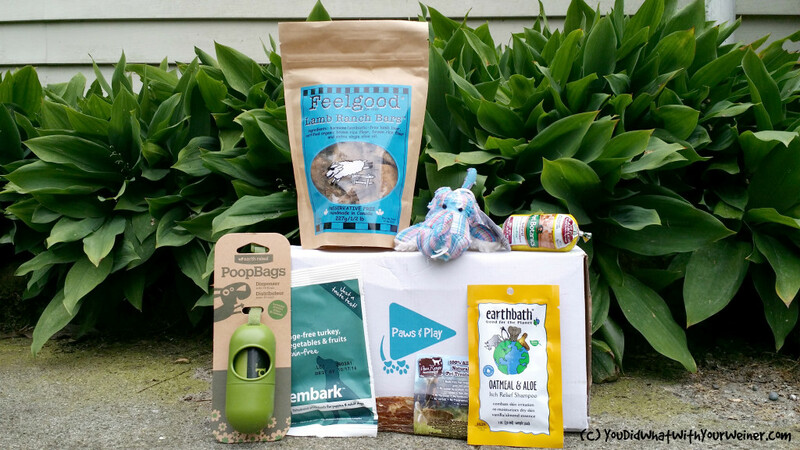 Paws & Play sent us three boxes to review – a Premium Box for small dogs, a Premium Cat Box, and a special edition “green” To Go Box. The small dog box contained 7 products, including 2 non-food items. The highlights for us were The Honest Kitchen Keen sample we can use to still feed raw when we travel and the chew from Open range Natural Pet Treats. The cat box came with 7 products. I don’t currently own a cat but if I did I think they would have been very pleased. The highlights for me were the Pure Bites, the toys with feathers, and the waterless bath (because we all know that most cats hate baths). This Earthbox was a special edition box. Paws & Play does not currently offer “Green” as one of their box options but some of these products might show up in their regular boxes (note: They are in the process of organizing further limited edition boxes due to the amount of positive feedback they got from this box). The box contained 7 items, including our favorite Earth Rated poop bags and a travel packet of Oatmeal and Aloe shampoo from Eearthbath. 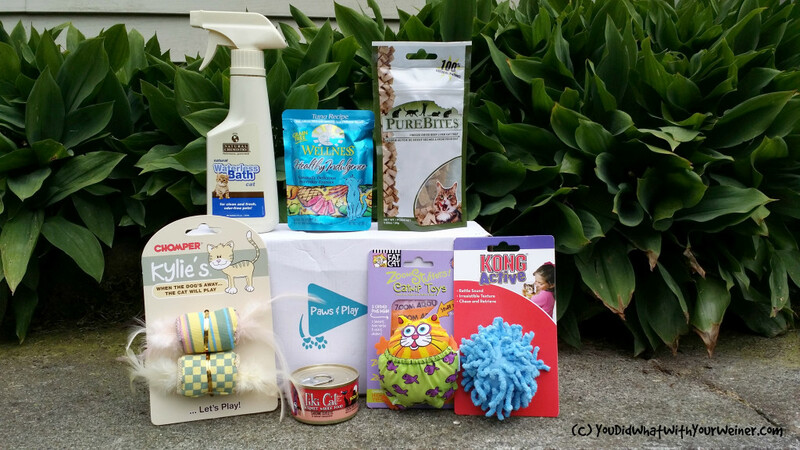 I was very pleased with the products that came in the Paws & Play box and there were very few items that I won’t use. I won’t use them not because they were of poor quality. They just weren’t a good match for us. I think it’s near impossible for any subscription service to give you products that are a 100% match 100% of the time. I donate any items that I don’t use to a local animal rescue and some of the cat goodies with be going to my “with cat” friends. I like that Paws & Play puts customer service first. This Canadian-based company doesn’t gouge US customers with high shipping costs. Also, customers are free to email them with allergies and intolerances and they will do the best to accommodate them. Overall, I would say the Paws & Play Box rated better than average for us. Disclaimer: This post is sponsored by Paws & Play. I received three Paw & Play boxes in exchange for my honest review. Here at YouDidWhatWithYourweiner, free does not equal good so everything we say is really how we feel about the product. Paws & Play is not responsible for the content of this article. Nice!! Looks like great stuff!!! Love that there are now 2 Canadian boxes. Shipping things from the US is always expensive for pus, and we like to support Canadian companies. I can imagine! I don’t order a lot of stuff from Canada but some companies charge a heck of a lot for shipping. I mean, I understand why but….. I wanted to order collars from the US once. The 2 collars were about $25. they wanted to charge me $100 for shipping. I said no thank you! What is the other Canadian Box? ♥ With glowing hearts ♥ Canada represent! I will have to check this out. I would love to get subscription box for Koly & Fe, but the US ones can be pricey to ship here. Love it! I wish that it wasn’t so expensive to ship from Canada to the US and visa versa. I mean, we are on the same continent. I feel like it shouldn’t be so difficult. Do you think it has to do with import taxes or something like that? I don’t know about down there, but up here, we get a separate bill for import taxes. (For example, I ordered and art print from a site in the US. The print was $25 and shipping was $12. When it arrived, I had to go to the post office and pay $13.55 in duty & taxes.) Mail (and everything) in general costs more here. So, there’s that. Thanks Michelle. People certainly get a big kick out of the name 🙂 I hope you like the box if you try it. Do you know how it works if we want to cancel the subscription with Paws & Play? There is no information about this on their website… Thanks much! Hi Annick. I don’t work for them so I can only take a guess. My assumption is that you should contact them through their email – info@pawsandplay.ca. Hope it works out.